You may be about to unplug, but your office sure isn’t. Your boss granted your time-off request, and now you’re counting down the days until that much-needed getaway. 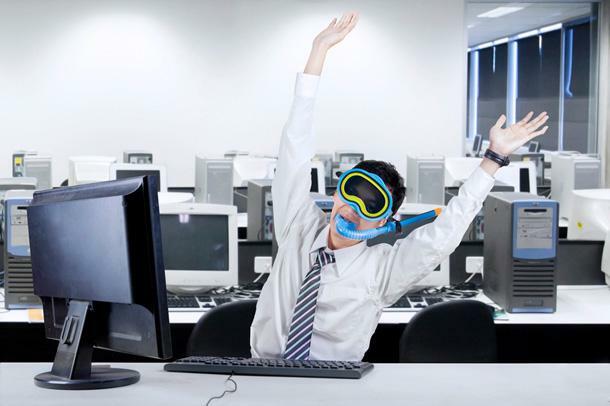 You might already be on vacation in your mind, but there are a few bases that absolutely must be covered at work before your body actually leaves the building. Ensuring that your projects and duties are thoroughly taken care of in your absence is a hallmark of a responsible employee. Not only will you have the peace of mind that there’s no mountain of work awaiting your return, but your co-workers will thank you for not having to scramble to deal with deadlines you forgot to mention were in the pipeline. And if that monumental faux pas winds up happening, there’s a definite chance they won’t let you off the hook while you’re attempting to decompress. “There’s nothing that kills a vacation vibe faster than having to plug back in to work while you’re away because you’re the only one who can handle a particular emergency,” says Marissa Brassfield, a productivity expert with Ridiculously Efficient based in Toluca Lake, California. Avoid any vacation interruptions and disgruntled co-workers by doing these three things before you take off. It’s good to always have a list of your ongoing projects handy, but especially so before you leave for vacation, says Tor Refsland, a productivity expert and founder of TimeManagementChef.com. Include a summary of each project, its current status, deadlines that will hit in your absence and any necessary contacts. An important part of this step includes anticipating any problems, Brassfield says. Make a list of possible worst-case scenarios, and provide clear instructions as to how co-workers should handle each. Don’t leave it up to them to figure out what to do. It’s important that those taking the reins for you understand exactly what they’ll be doing while you’re gone. Schedule a meeting with whoever is covering for you to review what’s in store. Want to get on their good side? Buy them lunch—or at least coffee—while you meet with them as a thank-you for having your back. During the meeting, provide an overview of the tasks they are taking on, along with any resources or documents they might need, Refsland says. Go over each item to be sure they understand what is needed of them, and answer any questions if they need clarification. If you review everything appropriately, you likely won’t be greeted by a substantial to-do list upon your return, says Kirstin O’Donovan, productivity expert and author of Maximize Your Time to Maximize Your Profits. You should be able to move forward as if you never left. Just because your boss signed off on your vacation request doesn’t translate to an out-of-sight and out-of-mind situation. Either arrange a brief in-person meeting to bring your boss up to speed, or provide him or her with an email that explains which of your co-workers are covering your jobs while you’re away. Also tell your boss about the potential problems that you identified and how you instructed your co-workers to handle them—this demonstrates leadership, Brassfield says, and shows you’ve done everything in your power to proactively maintain momentum on your key projects. Before you know it, your vacation will be over and you’ll be back to the daily grind, so don’t spend your precious time off connected to company servers and fielding emails from harried co-workers. Tie up those loose ends so you can kick back like a real professional. Want to know other ways you can bring your best self to work every day? Join Monster for free today. As a member, you'll get career advice, best practices for the workplace, and job search tips sent right to your inbox. Balancing your job with the rest of your life can get tricky, and you don't want either to fall by the wayside. Learn how to strike the right balance at every step of your career.